The Play about Pronouns: "I and You"
As many regional theaters across the country can attest, Gunderson achieved her goal brilliantly with this shattering play about two teenagers getting to know each other while working on a school project, analyzing Walt Whitman’s epic “Leaves of Grass.” There is, in fact, a huge twist at the end that is almost impossible to anticipate and packs a formidable punch, as the audible gasps of my fellow audience members can attest. But the script’s stunning eleventh hour reveal is much more potent than a clever magic trick because the overall conceit, the careful and specific use of Whitman’s poetry, and characters who lead us there are all extremely well crafted. They are also beautifully brought to life in a vibrant production at Next Act Theatre running through April 29. Directed by Artistic Director David Cecsarini and featuring young-ish performers Cristina Panfilio and Ibraheem Farmer, the two-hander feels much bigger than that, at the end of 90 minutes. As the lights come up we meet Caroline, a chronically ill teenager whose medical condition has worsened to the point that she can no longer attend school. But far from a sad, bed-ridden waif she bounces on her bed rocking out to her favorite music, and rules over her tiny second floor bedroom, which she has covered with photos she’s taken, favorite pictures from magazines, a collection of sunglasses and art supplies, and bright pastel colors. She is feisty, a little prickly, exuberant, unsure of herself, full of one-liners, and more than a little bitter about her situation. She also loves glitter. Pay careful attention to those pronouns. That’s what the paper is about. And take note when Anthony later recites, “For every atom belonging to me as good belongs to you.” That’s what the play is about. As one might expect from this set-up, much of the conversation and conflict between these two unlikely English project partners explores Caroline’s angst about being sick for her entire life and the ridiculously unfair possibility that she may die soon. While acknowledging that girls are very weird and may not be worth the trouble, Anthony’s conversations focus on converting Caroline to a Whitman fan, finishing their assignment, and discovering how much the two of them actually have in common. Though she is in her early 30s, Panfilio’s energy, her sleight, wiry frame, and in this case, her messy bangs and unkempt hair, matched the 17 year-old Caroline. 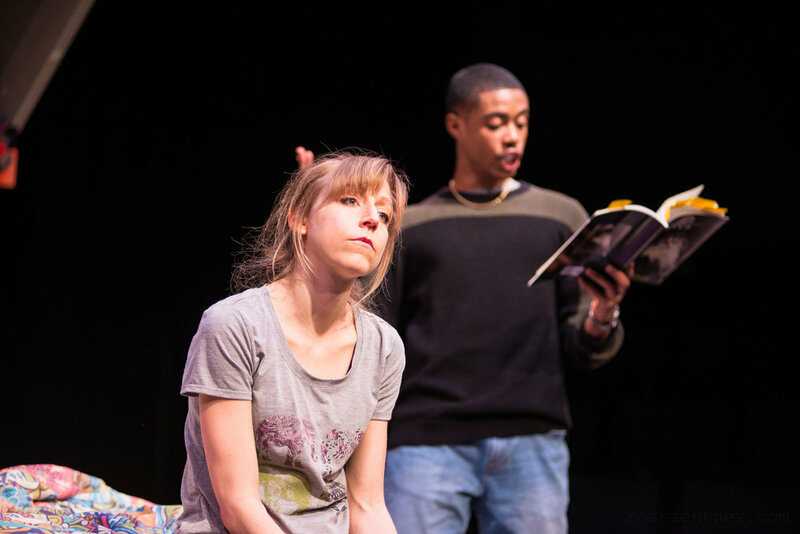 All elbows and goofy looks, bursts of energy and texting thumbs, she infused the character with a hint of playful Puck (which she played last season at American Players Theatre) and the melancholy of a young woman with an old, suffering soul. Who: Directed by David Cecsarini, featuring the funny and fearless pair, Cristina Panfilio and Ibraheem Farmer. Why go? Sure, it’s about two teenagers grappling with dumb parents and really old poetry, and homework and snapchat. But it’s also about celebrating what connects all of us in a profound and surprising way.